Long time gifts at a wedding was received only by direct heroes of the occasion – a young married couple. But the last some years enjoy the increasing popularity the European wedding tradition taking the roots in the Middle Ages according to which between the young and invited there is a mutual exchange of gifts. 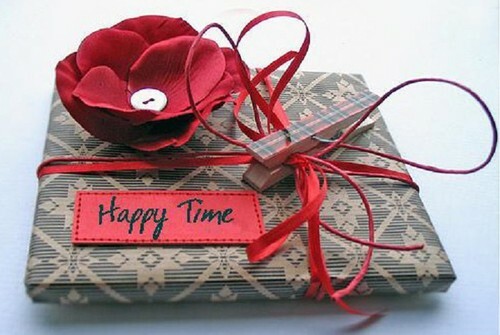 To thank attendees at wedding by small gifts in many world countries an indispensable condition. Always pleasantly to receive a gift, it will be pleasant to guests to carry away home a lovely surprise which will keep a part of general pleasure and a positive. The bonbonniere can be a universal gift for all attendees. It is a small beautiful box with sweet delicacies in which there can be candies, wedding gingerbreads, small chocolates, the candied berries or nutlets in chocolate glaze. Sometimes the bonbonniere represents the real work of art. 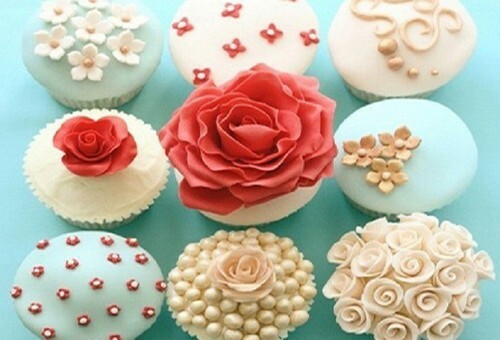 When guests eat the food put there, packing leave for memory and use as a moneybox, a casket for buttons or jewelry. Such gifts for guests at a wedding can be made the hands, having bought a nice box in specialized shop, and sweet in a candy store. Also originally the lovely hearts and muffins decorated with multi-colored glaze, packed into a transparent wrapper look. Besides an entertainment it is possible to put a small souvenir in a bonbonniere for memory, for example, a magnet on the refrigerator or a charm. 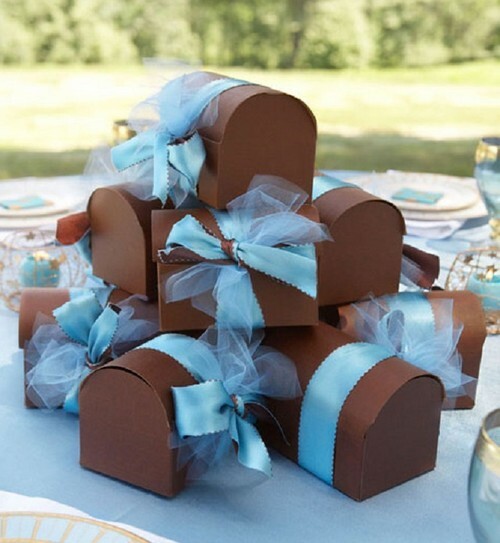 Instead of boxes sacks from fabric, the wooden trunks or paper envelopes decorated with lace, satin ribbons and small flower buds will also be suitable for packing. Cups with a symbolical inscription and a memorial, and also small calendar cards on which young spouses will be represented will become original gifts for guests at a wedding. If the budget allows and the invited guests will be not much, it is possible to order a bottle of good wine or champagne on which label there will be a photo of newlyweds and date of a solemn event for each family. If everyone wants to make a gift, tiny small bottles with alcohol or chocolate bars perfectly will approach. Very often newlyweds get small figurines, moneyboxes, candlesticks and a photoframework. 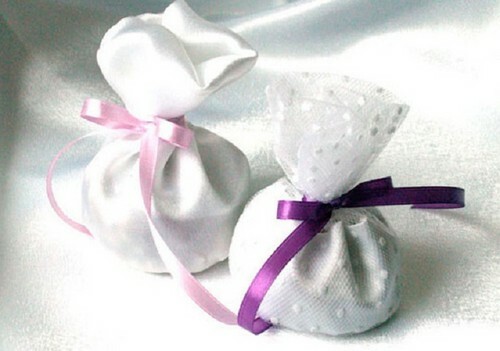 Besides gifts it is necessary to prepare small prizes for those who will take part in wedding competitions. Different trifles – soap bubbles, Chupa Chups, handles, vases, notebooks, small toys, decorative candles, soap and shower gels in the form of hearts, chocolates medals and many other things are for this purpose bought. 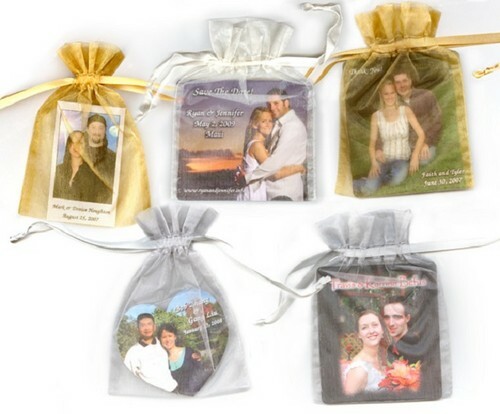 It is good to prepare consolation prizes for those who will catch a wedding bouquet and the bride's garter. Girls can order cake in which they will find a prediction of happy destiny, to give guys a similar gift, only in predictions to write something courageous. After a wedding it will be for certain interesting to guests to look at a disk with cheerful dances and competitions in which they participated therefore it is desirable for newlyweds to make the copy to each family. Undoubtedly, all attention in day of solemn wedding is riveted on a young married couple, they receive congratulations, kisses, bouquets of flowers and gifts from all guests. But they should not forget the relatives of people thanks to whom the young were born. The wedding tradition to present mother and the father of the newly married exists in many countries. Thereby children show respect and appreciation that parents could give life and grow up the worthy person their soulmate. Future daughter-in-law at a wedding, by tradition, hands gifts of the mother-in-law and to the father-in-law. It optional have to be expensive things, the most important that they were not only pleasant, but also useful. It is best of all to buy a subject, for general use in the apartment or a country house, it can be technical devices which will help to facilitate house efforts (the electric meat grinder, the crock-pot, the mixer, the coffee grinder or the bread machine), sleeping accessories (a beautiful cover, a blanket, a linen set, a plaid), kitchen devices (a set for a fondue, a set of pans, coffee or tea services). The sets for a sauna consisting of dressing gowns with the embroidered initials and towels will become a fine and at the same time practical gift on a wedding to parents from newlyweds. A fine touching surprise will become if the bride presents to the new family a big portrait on which the groom will be represented together with parents. The artist needs to order only such gift in advance that he managed to perform work in time. If the wedding budget allows, the mother-in-law will be pleasantly surprised, having received from the son's wife jewelry, and to the groom's father - stylish cuff links and a clip for a tie. As an alternative this gift will be suitable strainers for tea and the spoons made of silver. The decorative fountain of the small size or an artificial fireplace which will perfectly decorate a living room will become an excellent gift. The young spouse, taking away the darling from the house of parents has to give them mementoes. Household appliances will look very symbolically, for example, getting from a box the vacuum cleaner or the machine for washing of ware, the son-in-law can tell that brought the assistant who will help about the house instead of their daughter. To avoid an embarrassment and not to present to parents that they already have, it is better for young spouse to consult to the beloved, after all who better her knows tastes of the father and mother. Perhaps, they want to buy the digital camera, a humidifier, the color printer for printing of family pictures, wireless phone or a salt lamp long ago. If money allows, the country site in a picturesque place can become a fine gift on a wedding to parents from newlyweds. In case the father-in-law with the mother-in-law has everything, acquisition of the permit to the country where they dreamed to visit will be the best way out. At rather modest budget identical t-shirts and cups with symbolical pictures and inscriptions perfectly look. That none of parents did not take offense, it is possible to present all identical gifts. 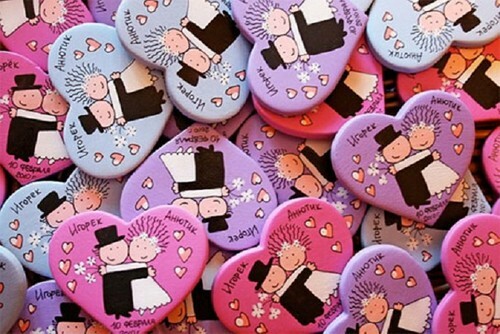 As traditional budgetary option special medals will be suitable for a wedding celebration with inscriptions: "The best mother" and "The best father". If newlyweds expect to give parents on a wedding more expensive gift, everyone can buy watch and to engrave on them a memorable inscription. Good automatic umbrellas or an electronic photoframework in which then it will be possible to place touching photos of wedding will become the budgetary, but very necessary gift. They will long remind parents about this fine day. 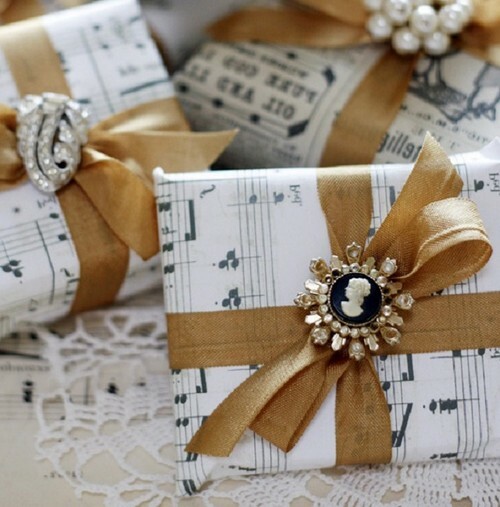 Tickets for a concert or in theater will become pleasant addition to any gift expensive or not really. Parents with great pleasure descend on this action all together. There they will have an opportunity to get acquainted closer, to find a common language and by that to fasten the relations with each other.